Front end estimation: Estimating the answer to an algebraic, mathematical or arithmetic calculation by simplifying numbers. Although precise answers to algebraic, mathematical and arithmetic calculations is necessary, it is highly helpful to take an educated guess about the correct answer to a calculation particularly when the numerical values of the numbers are lengthy and complex. For example, when you are asked to add or subtract very large and cumbersome numbers, it is highly helpful to take an educated guess about the correct answer to a calculation to avoid large and avoidable miscalculations and careless errors. A highly useful estimation strategy called front end estimation. Front end estimation entails estimating the answer to an algebraic, mathematical or arithmetic calculation by simplifying numbers. When numbers are simplified and front end estimation is used, it will not give you the PRECISE answer to the calculation, but it will give you an approximate answer. You should, then, be able to compare your precise answer and calculation to the approximate answer that you got using front end estimation. When you get the approximate answer to a calculation with front end estimation, you can then compare your precise mathematical calculation to this estimate and see whether or not your calculation is close to and in the same "ball park" front end estimation. If your precise answer to a calculation is in the same "ball park" as the front end estimation, you can be relatively sure that your precise calculation is perhaps accurate, but only if you carefully perform and check each calculation for any careless errors and mistakes. When, however, your "ball park" front end estimation is out of the range of with your precise calculation, something is wrong. When this happens, recheck your front end estimation and your precise calculation until these two are within the same "ball park". The front end estimation strategy involves the changing of numbers into zeros with the exception of those in the "front end" which are the beginning numbers starting on the left of the numbers. Below are examples of front end estimations and how these estimations compare to precise calculations. Round off the 64 and the 61 leaving the front ends or the front, left most numbers, that is the 6 s, in place when the rounding off uses a number that is less than five, which the 4 and the 1 are. If, instead, the numbers were 67 and 69, for example, the 6 and 7 at the front end would be rounded up one number because both 7 and 9 are more than five. As you can see, the front end estimation is very close to the precise mathematic calculation. Round off the 604 and the 716 leaving the front ends that are the 6 and the 7 in place when the rounding off uses a number that is less than five. Round off the 1,234 and the 5,678 leaving the front ends of 1 in place and rounding up the 5 to 6 because the 2 in the first number is less than five and the 6 in the second number is 5 or more. Again, as you can see, the front end estimation is very close to the precise mathematic calculation. The front end estimation procedure for subtraction, multiplication and division is the same procedure that was done with addition above. As you will see, the same rules apply to all arithmetic calculations including multiplication and division, when front end estimations are done. There are many occasions and situations where mathematics is not as precise as we often think it should. An example of this lack of precision is obvious when we consider our different measurements systems, including the household measurement system, the apothecary measurement system and the metric measurement system. There are few precise conversion factors from one measurement system to another; most are approximations. These approximations, however, when accurate, are acceptable to use according to the standards of measurement. Although measurement system equivalents are often shown with an = sign, they should be more accurately shown with the ≈ sign which means about and approximately, rather than equal. Rounding numbers make them easier to work with to get some "ball park" guestimates, as discussed in the section above that detailed front end estimation; and the rounding of numbers is also used to calculate mathematical and arithmetic calculations to a shorter, more meaningful number, as shown below. Rational numbers, including fractions, ratios, whole numbers, zero, positive numbers, negative numbers, and decimal numbers can be rounded off. Many mathematical and arithmetic calculations on TEAS will instruct you to round numbers off to the nearest place such as "to the nearest tens", "to the nearest hundreds", "to the nearest thousands place" or "to the nearest whole number", etc.. The TEAS may also instruct you to round off to the nearest tenths, hundredths, or thousandths place as well. When rounding off numbers, you must examine the number AFTER the desired rounding off spot. If this number is 5 or more, you will round off the desired rounding off number by increasing it by one (1). If, however, the number AFTER the desired rounding off spot is LESS than 5, you would not change the number before it. Some numbers must be rounded off or they will fill book after book. For example, the decimals 0.3 and 0.6 go to infinity. In this mathematical sense, infinity is never ending. The symbol for infinity is ∞. 0.03 will go to 0.033333333333333333333333333333333333333333333333333333333333333333333333333333333333333333333333333333333 and even more. It will go to infinity. 0.66666666666666666666666666666666666666666666666666666666666666666666666666666666666666666666666666666666 and even more. It will go to infinity (∞). 0666 rounded to the nearest hundredth would be 0.07 because the 6 in the thousandth place is 5 or more. 66666 rounded to the nearest thousandth would be 0.667 because the 6 in the ten thousandth place is 5 or more. Positional notations are used in whole numbers, decimal numbers and combination whole numbers with decimal places. These positional notations occur on both sides of a decimal point. 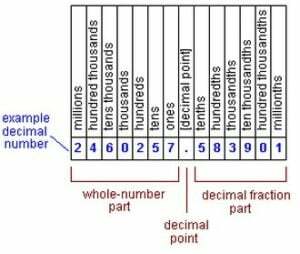 The numbers to the left of the decimal point are whole numbers and the numbers on the right side of the decimal point are decimal numbers. When rounding off whole numbers, you must examine the number AFTER the desired rounding off spot. If this number is 5 or more, you will round off the desired rounding off number by increasing it by one (1). If, however, the number AFTER the desired rounding off spot is LESS than 5, you would not change the number before it. As previously discussed, positional notations are used in whole numbers, decimal numbers and combination whole numbers with decimal places. Positional notations are used in whole numbers, decimal numbers and combination whole numbers with decimal places. These positional notations occur on both sides of a decimal point. The numbers to the left of the decimal point are whole numbers and the numbers on the right side of the decimal point are decimal numbers. When you have to round off to the nearest hundredth, you must look at the next number, or thousandths, and determine if it is less than 5, equal to 5 or more than 5. In the examples below, the tenth place will be highlighted with green, the hundredth place will be highlighted in pink, the thousandths place will be highlighted in orange and the ten thousandths place will be highlighted in turquoise so you can readily see and distinguish among these decimal places. The number 45.7589 is 45 and 7589 ten thousandths. This number rounded off to the nearest thousandth is 45.759 because the number in the ten thousandth place is 5 or more. You round off a number to the nearest thousandth by looking at the number in the next place, which is the ten thousandth place. If this number is five or more, you would increase the 8 in the thousandth place to 9. If the number in the ten thousandth place had been less than 5, this number would be rounded to the nearest thousandth as 45.758; the 8 would not be increased by one when the number in the ten thousandth place is less than 5. Now, here are some numbers rounded off to the nearest tenth. Remember, if the hundredth place, or 2nd number after the decimal, is 5 or more, the tenth place is increased by 1; and if the 2nd number after the decimal is less than 5, the number in the tenth place remains the same. Here are some numbers rounded off to the nearest tenth. Please note the pink number in the hundredth place (2 numbers after the decimal) is the one that determines whether or not the number in the tenth place (the first number after the decimal) moves up 1 or remains the same. If the pink number in the hundredth place is 5 or more, the number in the tenth place is increased by 1; and if the number in the hundredth place is less than 5, the number in the tenths place remains the same. Here are some numbers rounded off to the nearest hundredth. Please note the orange number in the thousandth place (3 numbers after the decimal) is the one that determines whether or not the number in the hundredths place (the second number after the decimal) moves up 1 or remains the same. If it is 5 or more, the number in the hundredths place is increased by 1; and if the number in the thousandth place is less than 5, the number in the hundredths place remains the same. Here are some numbers rounded off to the nearest thousandth. Please note the turquoise number in the ten thousandth place (4 numbers after the decimal) is the one that determines whether or not the number in the thousandths place (the third number after the decimal) moves up 1 or remains the same. If it is 5 or more, the number in the thousandths place is increased by 1; and if the number in the ten thousandth place is less than 5, the number in the thousandths place remains the same. There are many occasions when a whole number with decimal places has to be rounded off. In order to perform this rounding off accurately, it is highly important that you clearly differentiate between ten and tenths, hundreds and hundredths, thousands and thousandths, ten thousands and ten thousandths, hundred thousands and hundred thousandths, millions and millionths. For each of these pairs, the first place, for example hundreds and thousands, refer to the positional locations to the left of the decimal; and the second place in these pairs, like the hundredths and thousandths, indicate positional places to the right of the decimal. For example, if you are asked to round off 67.91 to the nearest tens, you would round this number of to 70 because the 7 in the ones place is equal to or more than 5 and, if, you are asked to round 67.91 to the nearest ones, you would look at the tenths place to the right of the decimal point. Because this tenths place is 9 and 9 is equal to or more than 5, you would round up the 7 in the ones place to 8. The answer is now 68 rounded up to the nearest ones. Round off this number: 345.987 to the nearest hundred. You will leave the 3 in the hundreds place as 3 because the number 4 in the tens place is less than 5. Round off this number: 3,653.987 to the nearest thousand. You will increase the 3 in the thousand place to 4 because the number 6 in the hundreds place is equal to or more than 5. Round off this number: 345.987 to the nearest hundred. You will leave the 3 in the thousand place because the number 4 in the hundreds place is less than 5. Round off this number: 3653.9879 to the nearest thousand. You will increase the 3 in the thousand place to 4 because the number 6 in the hundreds place is equal to or more than 5.